Its no secret around these parts that there is no significant manfriend in my life right now and with the exception of the four week blip that was J, there hasn’t been one for quite some time, because I choose for it to be that way. I’ll admit it can be pretty lonely. There are nights I wish I had someone to go to dinner with, or curl up on the couch and watch a movie with. It would be nice to have someone to look forward to coming home to after work, someone to cook supper for. I wouldn’t complain about having someone to have adventures with that were worthy of blogging about, or at least to take pictures of me for the blog. And on those mornings I have to get up super early to take care of the snow in my driveway, it would be really really convenient to have a guy around.With that said I don’t question my choice to be single. My aunt once told me that you can’t find Mr. Right when you’re with Mr. Wrong. At the time that she said it I’m pretty sure I rolled my eyes, because she has a thing for cheesy lines, and I liked to blow off her positive thinking, inspirational, motivational mumbo jumbo. And because, how do you know he’s not Mr. Right unless you date him? duh. Looking back, I guess I just wasn’t mature enough then to truly understand what she was saying. At the time I was in a pretty serious relationship with E, and although I knew it was going nowhere, that the relationship was more of comfort and convenience, I wasn’t ready to admit that to myself or my family or the world. And if I’m being completely honest, I just couldn’t seem to get up the nerve to break up with him. Instead, I emotionally checked out of the relationship and put myself (and E) through more than six months of unhappiness before we finally broke up. Even after I did that I didn’t realize that during those last few months of knowing I was with Mr. Wrong and of not being able to call it quits, I had been unavailable to any potential Mr. Right’s that came along. It took me moving and falling into another relationship that deep down I knew was going nowhere, and wasting another year of my life to realize what my aunt had tried to tell me. Its better to be single than it is to be with someone who’s wrong for you just for the sake of having someone. 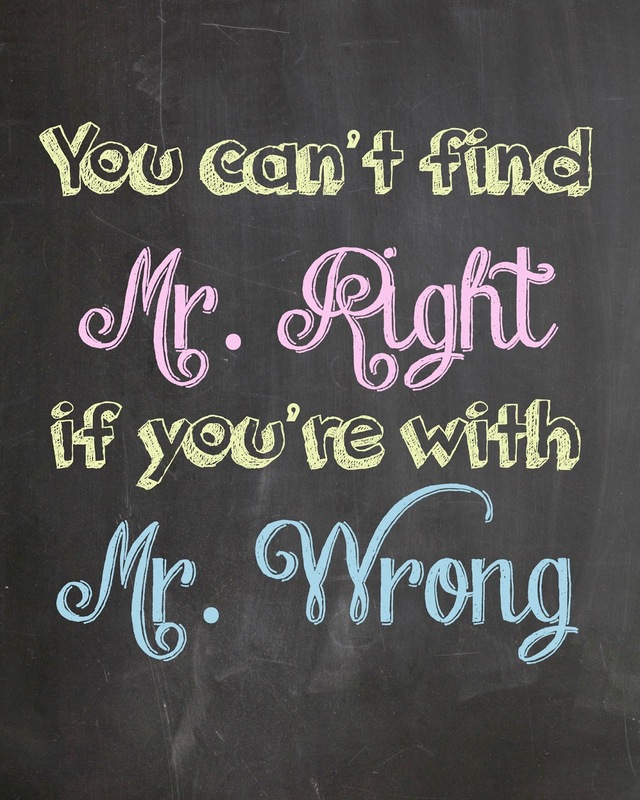 Because when you’re with Mr. Wrong you’re unavailable and not leaving yourself open for the possibility of finding Mr. Right. In the last 24 months I haven’t really met anyone I can even imagine the possibility of a future with. So, I’ve decided not to settle and not to date someone because I get lonely sometimes. When a potential Mr. Right comes along, I want to be able to pursue the possibility. Amazing! I feel exactly the same way. I think we would be BFF's if we met in person. I refuse to date the wrong person just to avoid being alone. I love spending time with myself and have no problem going to dinner, movies or traveling alone. It's so much better than being emotionally checked out of one relationship but still being unavailable for another. I have too many friends that tell me they NEED a guy and CAN'T be alone, but have they honestly ever given it a real chance, or just succumbed to the loneliness and stayed in unhappy situations? One thing is for certain…that will never be me!